You have disabled cookies in your browser. Please enable this feature, so all shop functions will be available. On the Barcelona.de online shop you can find almost all you need for an exciting Barcelona trip. 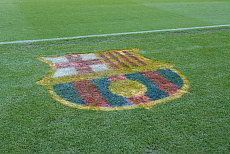 You have the choice of our city tours, tours, tickets for the FC Barcelona, ​​tickets to events, tours and more. Give away a special experience for christmas, birthdays or other occasions. 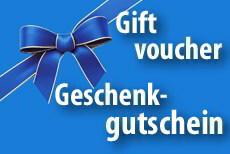 The Barcelona.de gift voucher is valid for all our products, guided tours and trips in our store (except for hotel bookings) and can be redeemed for the following 3 years after the purchase date. 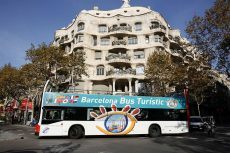 The Barcelona Card is the ultimate City Card: save money with free and unlimited use of public transport, free and discounted admissions to museums and attractions, as well as lots of discounts in shops and restaurants. 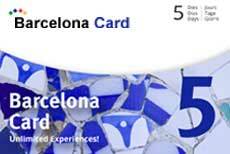 You can book the Barcelona Card, for 2, 3, 4 or 5 days. Here you can experience sightseeing in its purest sense. In the open top deck of the convertible buses you will have a great view of the sights of Barcelona. The buses run on three lines through the city and you can get on and off at any time. It’s ideal if you'd like a good general overview of the sights. You can get the tickets here with a 10% discount on the normal price. With this Gothic Tour in English you can experience an exciting, amusing and entertaining tour that is rich in knowledge through one of the most lively districts of Barcelona, the Gothic district. The Camp Nou, Europe's largest football stadium is the home of the legendary FC Barcelona. Enjoy panoramic views of the pitch and look behind the scenes at the stadium operations. A visit to the museum is included. For the tour you can get an audio guide in several languages. With the prebooking you save money and time. This is the place to book tickets for FC Barcelona home matches in Europe's largest stadium, the Nou Camp. Experience superstars of the tradition-rich club, like Lionel Messi, Neymar, Xavi, Iniesta, Luis Suárez and many more. You will receive the game tickets from us by e-mail. 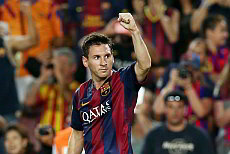 Barcelona.de is Official Ticket Agent of the FC Barcelona. Cheap booking fee and an excellent service can be garanteed. Antoni Gaudí's life's work, the Sagrada Familia, is without doubt the most important building in Barcelona. The monumental basilica is one of the most visited monuments in Spain. You can book a guided tour here and enter the building without having to queue. After the tour, you can stay in the church for as long as you like. Casa Milà is one of the last buildings designed by architect Antoni Gaudí, before he devoted himself fully to the construction of the Sagrada Familia. 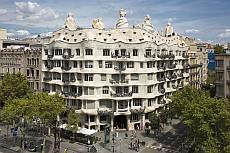 It is one of the most famous and most impressive buildings in Barcelona. An architectural masterpiece. 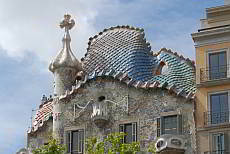 The Casa Batlló - with its curved dragon's back on the roof - is one of the most well-known private houses by the famous architect Antoni Gaudí. It is said to represent the dragon from the legend of Saint George. Your advantage: tickets without standing in line! See the most important buildings of the Modernism in Barcelona. During this about 2-2.5 hour long tour you will experience an entertaining guided tour along the famous house facades of the catalan art nouveau with a lot of interesting information. Our guide will answer your questions especially. The Palau de la Música, an architectural masterpiece on UNESCO's World Heritage List, is undoubtedly one of the finest concert halls in the world. 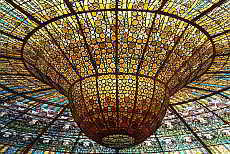 The construction shows the unsurpassed splendour of Catalan Art Nouveau (Modernism). Here you can book a guided tour of the building, and become enchanted by the magnificence of the construction. Raval is a very lively district with a special charm, shopping zones, numerous sights as well as many options to go out locally. During this about 2-2.5 hours long tour we will show you the sights and hidden sqaures of Racal, a district apart from tourism. You will receive a nice insight in the coAlourful life of this culturally diverse district. Our bike tour is ideal for everyone who speaks or understands English, who wants to get to know Barcelona in a short time but in a relaxed way. On a very comfortable bike you will get to know the “must see” places but also places away from the typical touristic paths. The bike tour is in English. 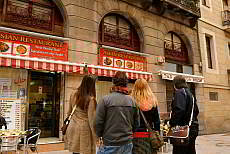 In Barcelona you can experience the transition of the tapas culture very good: During our approx. 2.5 hours long tour our English speaking guide will take you to several tapas bars where you get to try tapas specialities. 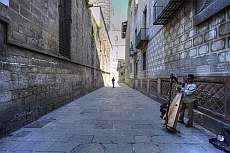 On the side you will learn a lot of interesting facts about the old town districts Barrí Gotic and El Borne. Flamenco at Tablao Flamenco Cordobes is of the highest artistic level. A foundation ensures that only familiar names and exceptionally talented young artists perform within the flamenco scene, with different shows about every 2-3 months. 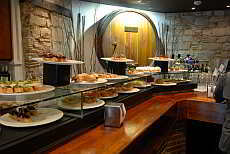 For the excellent dinner you can choose from a buffet with 65 homemade components, typical Spanish and Andalusian cuisine. The drinks are served by extremely attentive waiters. Glide along on a Segway. It's a fun way to get to know the city: with no exertion and using only slight body movements to set the vehicle in motion. You’ll be amazed at how easy it is to learn. The tour takes you through the Gothic Quarter to Port Vell and the beach, then to the Olympic marina. With our private German-language sightseeing tour you will see Barcelona from a very individual perspective. 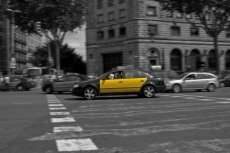 You will be collected from your hotel by a typical black and yellow taxi, a people carrier or coach. You will get to know the top sights of Barcelona - but also unknown sights in Barcelona which are well worth seeing. The sightseeing trip - planned according to your wishes or one of our selected routes to the most beautiful locations in Barcelona. A perfect start for a short trip to Barcelona: use the transfer from the airport or port to your hotel in Barcelona for a sightseeing trip. We will meet you right in the arrivals hall and help you with your luggage. Then we'll take you on an exciting sightseeing tour of the city. Finally we will take you to your hotel and, if you wish, help you to check in. There's hardly a more comfortable or exciting way to start your stay in Barcelona. Here you book a private arrival transfer from the airport or port. 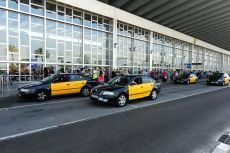 You will be collected right from the arrivals hall and taken to your taxi, people carrier minibus or coach. All at a fixed price. Here you can book a private Departure Transfer from Barcelona's city centre to to the El Prat de Llobregat airport or to the cruise port. You will be picked up atyour hotel lobby by the driver. The transfer is at a fixed price: all fees, extra charges and mileage are included. Sailing along the coast from Barcelona guarantees a very special view of the city. Get a cool breeze blowing in your hair and enjoy the sun. And in good conditions you can go swimming in the open sea. The tour is fun for young and old. 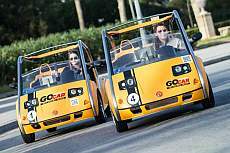 With a GoCar you can experience the city in a new way. These sophisticated yellow convertibles talk to you and take you on a city tour that you’ll never forget. The on-board computer and GPS system constantly make sure you stay on track and are informed about everything that’s on your route. So you can enjoy Barcelona from the very best perspective. MEAM is one of the most exciting contemporary art galleries in Barcelona. Every Saturday night you can experience excellent performances of classic music in a relaxed and comfortable atmosphere with a unique ambiance. MEAM is one of the most exciting contemporary art galleries in Barcelona. Every Friday evening midday you can experience excellent performances of blues, swing and related styles in a relaxed and comfortable atmosphere with a unique ambiance. Here you get 10% discount on admission. 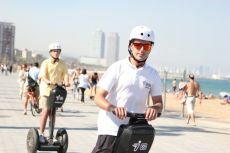 Explore Barcelona by bike: Whether you want to go on a sightseeing tour of the districts or are planning a bike ride along the beach, a rental bike is the ideal mode of transport. Pick up of rented bikes directly in the Old Town. 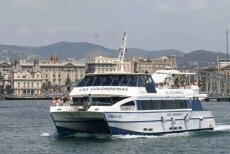 With the Golondrinas Coastal Tour, you can escape the hustle and bustle of the Old Quarter and Las Ramblas, and recover with relaxed sightseeing along the attractive coastline and great beaches of Barcelona. Fun for young and old! The tour is highly recommended, and is perfect as an entertaining outing with kids! The major advantage for you: no queuing at the ticket office! One ticket for six museums. With Articket BCN you have free access without queuing to six of the leading museums in Barcelona: Picasso Museum, Fundació Joan Miró, Museu Nacional d'Art de Catalunya (MNAC), Centre de Cultura Contemporània de Barcelona (CCCB), Museu d'Art Contemporani de Barcelona (MACBA) and Fundació Antoni Tàpies. 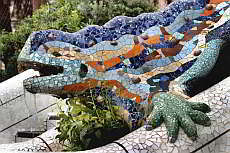 Book a Tour of Park Güell here. Gaudí created a unique and incomparable fairy tale park here. You can allow yourself to become quietly enchanted in this place. The bench decorated with broken tiles is world famous; Salvador Dalí even saw it as a precursor to surrealism. 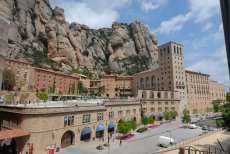 The mountain and monastery of Montserrat is surely one of the most beautiful destinations to visit in Catalonia. Here you can book a private, approx. 5-hour long tour with an English-speaking guide. You will be picked up directly at your hotel for this unforgettable trip. The La Roca Village is an outlet with over 100 boutiques and stores that invite you to go shopping. You will get to the outlet, which is located 35 km away from Barcelona, with the Shopping Express. Then you can calmly follow up your shopping wishes in La Roca Village. Book a full day excursion to the rugged Costa Brava here. The coast is famous for its picturesque villages and historic towns. This trip includes, among other things, guided walks in beautiful countryside, a trip on the Nautilus - a glass-bottomed boat, the Medes Islands and a visit to the ruins of Empuries. The trips take place on Mondays and Thursdays. With this tour you will experience a most impressive change of surroundings: from urban bustle to the tranquility of the Pyrenees mountains. Discover idyllic landscapes, high peaks, lush valleys, crystal clear streams, capricious craggy cliffs and picturesque villages. The tour starts every Saturday and Monday at 8:00. Enjoy a balloon flight across Barcelona's hinterland with a wonderful view of the landscape. Experience the smooth takeoff and the feeling of freedom and quietness, whilst enjoying a breathtaking view. Hover in 900 metres hight silently over Catalonia. The balloon flight is an extraordinary exclusive and unforgettable experience.